With verses and writings from the most famous books of halacha, serves as a source for many minhagim and is referenced thousands of times in books of the Poskim. The Rama quotes it many times in his glosses on the Shulchan Aruch. Name of the book marks the number of responsa in the first section of the book—354 (Deshen). 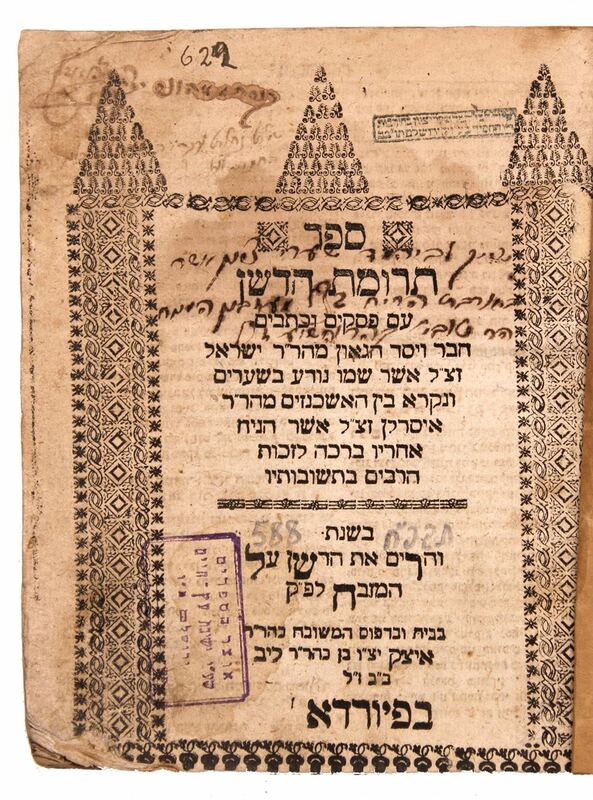 Second section is called “Psakim and Ketavim.” By Rabbi Yisrael Isserlin, known by the name of this book, a great sage of Ashkenaz in the 15th century and considered one of the last Rishonim or the first Achronim. Pritned by Rav Itzik bar Leib. Signatures and stamps of ownership, moth holes. Binding and pages 43, 44 (second section) are missing. , 122; 2-45 pages. 20cm. Generally ok condition.